Moving abroad seems like a fun way to explore the world and start fresh in your life. Nowadays, moving to a different country across the globe is very trendy. However, the world is massive, the numbers of countries where you can enjoy a new chapter of your life seem overwhelming. Is Vietnam one of the countries you are planning to move and start a home base? 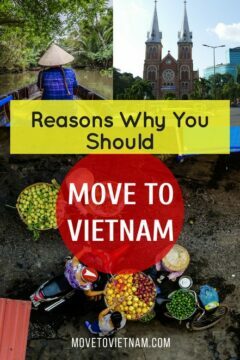 I’ll tell you why you should move to Vietnam, I will list down the reasons why this country is like no other when it comes to being an expat. I personally have lived both in Hanoi, the capital of the country and Ho Chi Minh (Saigon/Sai Gon), the biggest city in Vietnam. Even these two are the cities where most expats are living at the moment, there are a handful of other cities or towns you should consider. While here is an idea to help you about the moving cost o Vietnam. 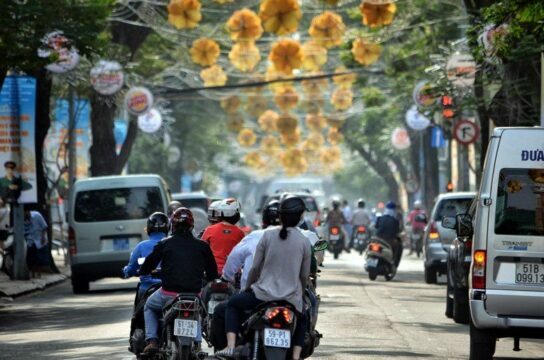 The cost of living in Vietnam attracts many expats from everywhere in the world. A lot of expats claims that Vietnam is not relatively cheap, for me, the cost of living here is down to how flexible you are. You can easily find an apartment for $1000 or $230 all depends on what lifestyle you are comfortable living in. If you are on a budget, dive in buy and sell groups to find the basic furniture you need. 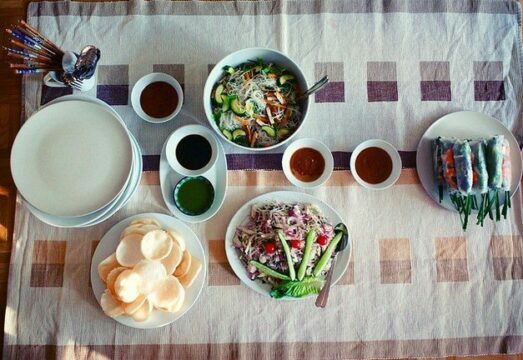 The food in Vietnam is cheap too, you can find home-cooked food outside for $1.25 or eat out in a restaurant for $4. Transportation is undeniably cheap as well, buy your own motorbike for $300 or take a bus for less than a dollar. Grab (like Uber) is massively used as well, which is the perfect way to beat the traffic. The use of bicycle is on the scene too, if this is something you picture yourself doing. You can read this article about budget for moving in Vietnam, it will help you have an idea how much to save before moving here. You probably have one or two Vietnamese restaurants in your hometown and you probably have enjoyed them. One of my Canadian friends told me how amazing Vietnamese food in Canada, I told her she needs to go to Vietnam to taste the real Vietnamese food; authentic, fresh, and affordable! Vietnamese takes pride in their cuisine, how can they not? Aside from it’s mouthwatering, I’d say it’s one of the healthiest cuisines I’ve ever tried. From the north of Vietnam to the south, you will be showered with dishes that are new to your taste bud which at the same time will not break your bank. This should be enough reason to move to Vietnam! What I find most amusing in Vietnam is how different their climate from the north, centre, and south of Vietnam. When I was living in Hanoi, no one prepared me that they actually have winter. I mean, it’s Southeast Asia, I don’t need to pack winter jacket – but I was wrong. At the end of December until the end of January, Hanoi and the rest of the north could be freezing down to 4 degrees. While the rest of the year, it’s hot with high humidity in this part of the country. If you are escaping the cold, the central and south Vietnam can accommodate you well. If you don’t mind the rain and the humid, you belong to this part of the country. Vietnamese is one of the hardest languages, that’s no secret. However, almost a decade ago, Vietnam started to hire a crazy number of English teachers, languages schools popped up like mushrooms all over the country. Resulting in a large number of young Vietnamese who can communicate with you well. This is also the reason for the next on my list. Given this, I still recommend you to learn basic Vietnamese, this will help you with your everyday life too. Vietnam is definitely a melting pot of ESL teachers, the demand rate of English teachers in Vietnam has skyrocketed and continuously soaring. As long as you have the right documents, you can easily land a teaching job. On the other hand, I do understand that teaching is not for everyone. Being one of the most popular bases for expats, the number of jobs for foreigners can be found around the corner too, like in hospitality and service industry, IT, Finance, Engineering, and more. "Get your TEFL Certificate and start teaching English in Vietnam. Grab your 35% off using moveviet as a coupon code"
If you are a remote worker, I’m pretty sure that internet plays a big role for you. Another thing that surprised me more is the fact that Vietnam has really amazing internet speed. The shared apartment I currently live has 35MBps, which I truly love! Getting internet on your phone too is possible, easy, cheap, and fast. I moved to Vietnam mainly because I know how amazing it is to travel here and I was not wrong. 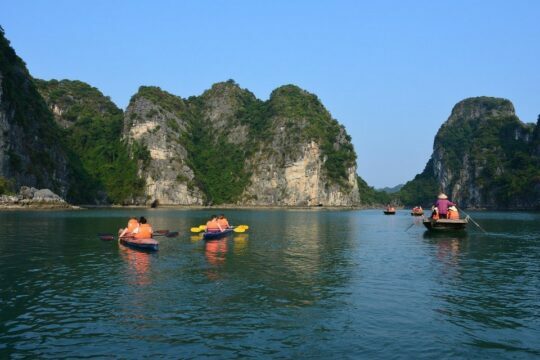 Vietnam’s geography is perfect, it is located on the coast which made it a perfect place for resort holiday, on the other side, it is rich in mountains to climb, forest to explore, wild animals to adore, and hidden gems to explore. 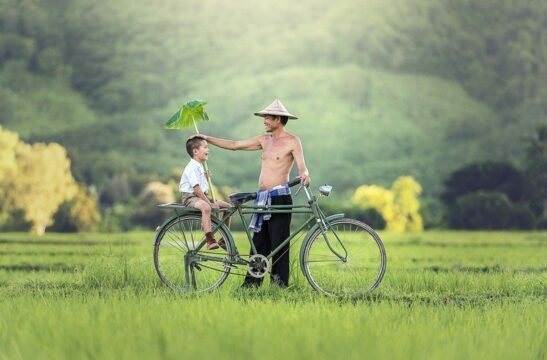 The fact that Vietnam could be travelled by bus, train, aeroplane, or even motorbike, made it so easy to travel around the country, the transportation in Vietnam is reliable. Plus, like what I mentioned before, it’s affordable to go backpacking in Vietnam. You can check here the best hostels in Vietnam. One more thing to love about moving to Vietnam is how easy to work their visa out. You can start with a business visa, you can obtain this even without having a job first hand, you can escalate to a work permit later. Obtaining a business visa will give you enough time to find an apartment, job, and even school for your children. If you don’t want to get a business visa, which is available for minimum of one year, you can get a tourist visa first to see if you will like the country, however, you cannot get a job or an apartment with this, if you do, you are basically doing illegal doings in Vietnam. Here, you can check how to apply for Vietnam visa. If you have finally decided to move, read this list of must pack for your moving, from there, you can download our free printable checklist for packing and getting ready. Vietnamese is probably one of the most hospitable and warm people I have encountered in my life. When I was living in the north of Vietnam, a local family invited me to live with them for a month, no questions asked, they provided me with my own room and fed me for the whole time I was with them. The locals are happy to help you out or simply speak to you in English. You will be offered food by your neighbours or will ask you if you need help. They will smile at you and greet you on the street and even make a small conversation despite the occasional language barrier. The expat community in Vietnam is massive and is very helpful. I moved to Ho Chi Minh City, the expat community is where I started to build a network of friends or simply finding answers to my everyday questions about getting around and finding everything in the country. Both Hanoi and Ho Chi Minh City have a huge expat base, while in smaller cities like Hoi An and Da Nang, I’m 100% sure you will find them too. In the last few years, together with the booming number of expats in Vietnam, this brought a great improvement in health care in the country as well. International companies in the medical field started opening their business here and offer top-notch and world class services. Many doctors in these hospitals are foreigners who studied and are practising in a western standard. Many of international hospitals hire staffs and doctors that can communicate well with expats and locals offering large language options. From affordable ones to expensive hospitals, they can be found throughout the country. Check out this list of medical clinics and international hospitals in Vietnam. I personally think Vietnam is a heaven place for expats, from easy visa to the cost of living, which I both find a big must when choosing a place to live, there is nothing else I could think why you should not move here. Although, I acknowledge that it's far from a perfect country, it's undeniable that Vietnam offers great things to expats who are looking for something they cannot find in other countries. Are you planning in bringing your pet in Vietnam? Check out this article about all the things you need to know about pets in Vietnam. If you need recommendation for hostels, check out our best Vietnam hostels. If you have any questions, drop us an email or comment below and we’d be happy to help!